Lindsay and Ben had a lovely wedding down in San Diego and I had the wonderful privilege of being there to capture their day! They exchanged vows at Solana Beach Presbyterian, then headed to Rancho Bernardo with the entire bridal party for pictures, and then partied the night away at Pearl Chinese Cuisine. Here are a few captures from their day. Enjoy! Also, a great big thanks to Evan Robinson for shooting with me that day. 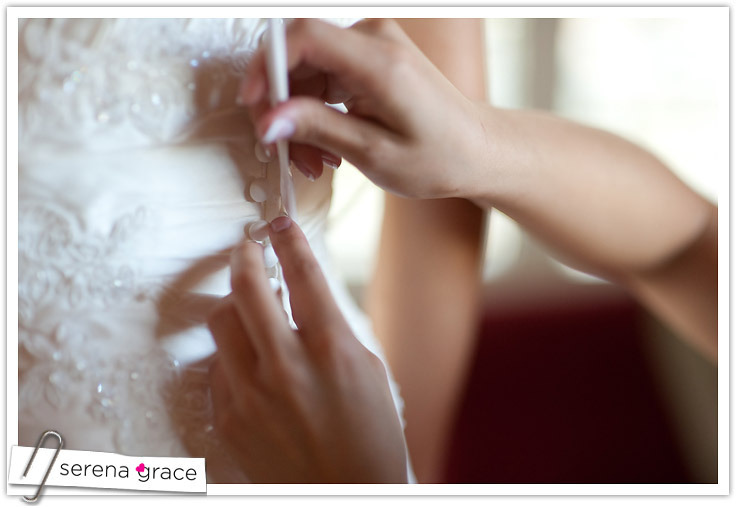 Love this shot Evan got of one of the bridesmaids buttoning up Lindsay’s dress! One of my favorite shots from that day! And a great detail of the ring by Evan. i love the first picture of the bouquet and the one with the bride's flower in her hair! all the little details were captured beautifully as well!! Gorgeous images as always Serena! I love the fresh details - those centerpieces are just perfect!